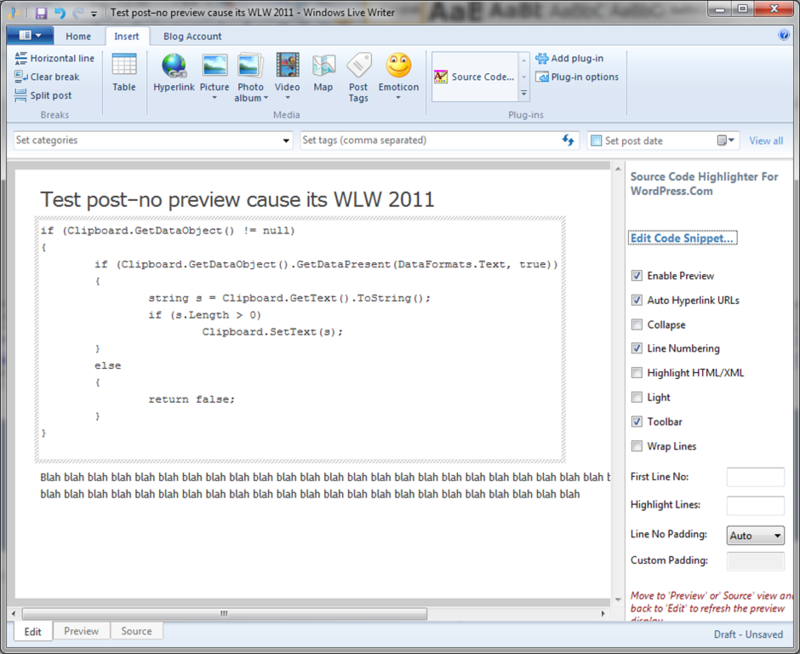 No Syntax Highlighting On Preview In Live Writer 2011? 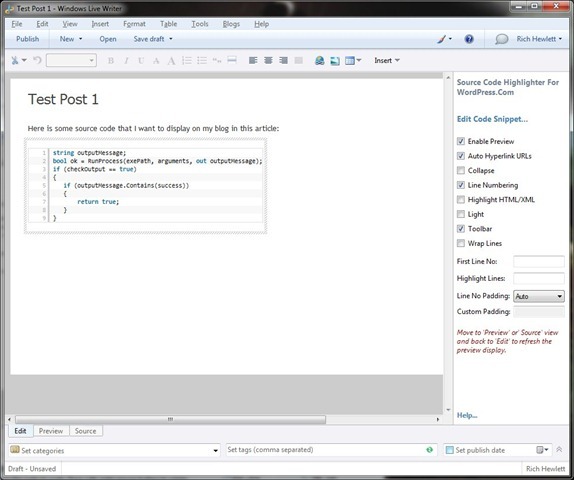 Anyone using my Windows Live Writer plug-in for Source Code highlighting will find that after upgrading to the latest Live Writer version the preview feature is not working. The latest version of Windows Live Writer that ships with the Windows Live Essentials 2011 package has some modifications to prevent script running from within the application. This is apparently to enhance security and whilst I think that this modification is a valid one on those grounds I would have expected a way of the user being able to disable this feature. To be honest I am not a fan of the new Live Writer as to me it appears as though the only objective was to get the ribbon toolbar included at the expense of most other things, including usability. To insert anything now I have to select insert on the toolbar and then select for example an image. Previously I just clicked on the right hand toolbar. The way that the plugin buttons are displayed on the toolbar is also poor in comparison to the previous version. Regardless of seeing it as a step backwards I do intend to support this version with my plugin and so will be releasing an updated version soon that will aim to provide some sort of preview functionality within 2011 (although I expect it to not be as convenient as with the previous version).